A stereo headset for children designed with kids' listening safety in mind. 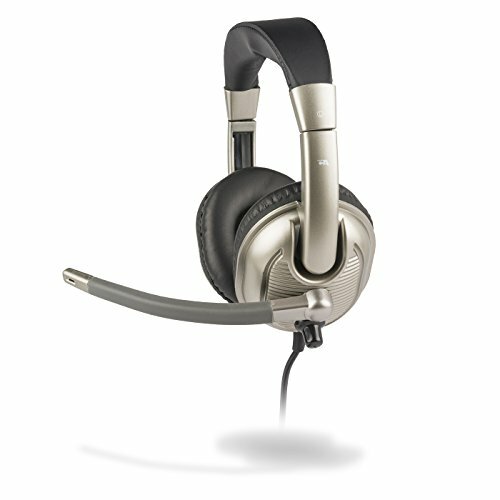 This headset features a safe volume level to preserve young sensitive ears, an adjustable padded headband and ambidextrous mic boom adjusts to fit small heads - on either the left or the right side. Easy to clean leatherette ear cushions enhance the comfortable fit. Durable design will withstand the harshest of use and environment. Quick and easy volume adjustment from each ear cup The Direct Noise Canceling Microphone Technology (DNCT4) allows for reliable voice recognition for student environments. Designed for PC use, using two 3.5mm audio and mic plugs. Speech / voice recognition ready. 30mm drivers. Monaural Voice Recognition USB Headset with Noise Cancelling boom Microphone for Dragon NaturallySpeaking 13, Dragon 13 Home, Premium , Professional & Dragon Dictate for Mac.